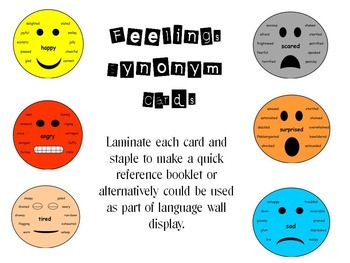 A set of 6 feelings synonym cards - angry, happy, scared, surprised,tired, sad. 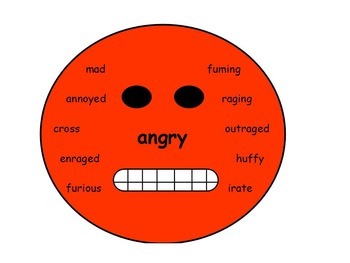 encourages children to use a wider range of vocabulary. All cards are on a face which changes expression to fit feeling. Cards can displayed on a literacy wall or laminated and hole punched to make a booklet for tables to use for writing purposes. Alternatively, could used in a literacy center.